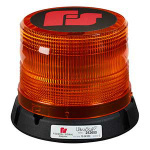 The Federal Signal UltraStar LED beacon utilizes a Federal Signal patent-pending emitter design that features the latest LED technology coupled with an innovative PCB design and layout. The emitter design provides a superior Class 1 warning signal that promotes work zone safety. The UltraStar LED also offers (14) selectable flash patterns that can be selected by the user through Federal Signal’s patented Power Select feature. The Power Select allows users to scroll through flash patterns by simply following a sequence of applying power to the unit 3 times in a row which will put the beacon into programming mode. Designed to meet the demands of a variety of work zones including DOT, construction, snow plows and utility vehicles; the UltraStar LED is potted so electrical components are protected against vibration. The UltraStar LED has a built-in permanent/1-inch pipe mount die cast aluminum base. Magnet mount and J-bolt mounting options are also available.